Alstom and its subsidiary NTL are sending Aptis, a new experience of mobility, on a three-week roadshow in the Netherlands. 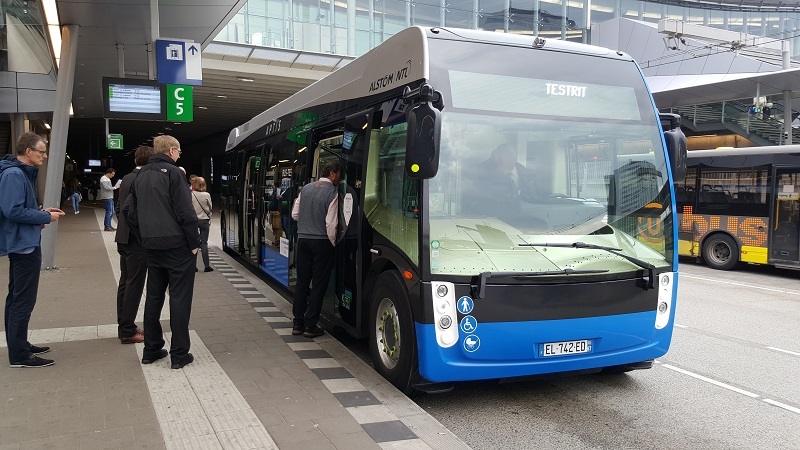 Aptis will be tested together with transport company QBuzz in Utrecht, Groningen and Assen, and with Rotterdamse Elektrische Tram (RET) in Rotterdam. The first week-long operational test begins on 9 April in Utrecht, before going to Rotterdam from 16 to 20 April. The roadshow will then continue in Groningen from 23 to 27 April, and in Assen from 30 April to 3 May. “We are pleased that Aptis is raising interest among Dutch cities with its ground-breaking features. This Dutch roadshow is a great opportunity to once again demonstrate Aptis’ unique insertion capacities within new urban environments. It wouldn’t have been possible without a real interest on the part of both Qbuzz and RET for modern solutions serving the mobility of tomorrow,” said Marcel Miller, Managing Director Alstom Benelux. Aptis, which has been co-developed by Alstom and NTL, won the Innovation Prize at the global bus exhibition Busworld on 19 October 2017, held in Courtrai, Belgium. The prototypes, which were manufactured at NTL’s production site in Duppigheim, France, are currently being tested in different cities in Europe. The tests in the customer depots as well as those under real operating conditions are designed to evaluate the specific characteristics of Aptis in a new urban setting, its charging system, its autonomy, and its insertion performance in traffic following the first successful tests in Ile-de-France (Paris and Versailles), Lyon, Strasbourg, Marseille, Belgium and more recently in Germany (Berlin and Hamburg). Aptis provides a unique, premium passenger experience: low floors throughout the vehicle and wide double doors allow smooth passenger flows and accessibility for wheelchairs and pushchairs. Panoramic windows at the front, the rear and all-along the bus provide 20% more window surfaces than a conventional bus, as well as a lounge area at the rear. The vehicle fits perfectly into the urban environment thanks to its two steerable axles that minimise the turning radius and the footprint on the road (-25% compared to a conventional bus). This performance is an advantage especially at bus stops, where an automatic parking system has been developed, reducing the space required for parking (and therefore leaving extra space other vehicles) and increasing accessibility for passengers. At night, Aptis can be recharged inside the depot. Alstom also provides a daytime charging solution at the end of each line. Rapid charging is carried out either via an inverted pantograph or via SRS, Alstom’s innovative ground-based static charging system. Thanks to reduced maintenance and operating costs, and a longer service life than that of a bus (20 years), the total cost of ownership of Aptis is equivalent to that of today’s diesel buses.